Anyway, the only down side to church today was that, once we got home and were getting Naomi ready for her nap, we realized we’d left a member of the family at church: Puppy! Naomi’s little lovey, “Puppy” (aka. “Buppy” or “Pup-pup”), was given to her by her Aunt Erica & Uncle Justen when she was born, and he is now a quintessential part of naptime and bedtime. He has come along on all of our trips with us, and we’ve even had to hire a second Puppy to fill in for the original Puppy, since he of course sometimes needs to be thrown in the wash, or in case we can’t find him. Well, substitute Puppy had to step up to the plate today. We had of course brought him along to Australia, and I’ve been hiding him in my closet (because, if she sees him, Naomi likes to have BOTH of the puppies and the whole purpose for having two is defeated. We let her have both at home but abroad we have a pretty strict one-Puppy rule – reason being, of course, that’s what we believe is in Naomi’s best interest). Anyway thank goodness for that, because at nap time today I could not find the original Puppy anywhere. I spent a few minutes searching the apartment for him before I remembered that Naomi had brought him to church with her this morning. In my mind I saw her climbing down out of my arms at creche with him clutched in her arms, as the thought briefly crossed my mind that he might get, shall we say, “shared around” with so many other toddlers in the play area with her. But I hadn’t wanted to take him from her, and had figured he was probably also a comfort to her as she’s still getting used to this new place and new people. But then of course after church neither Daniel nor I had thought to go looking for Puppy when we picked her up from creche… Conclusion: he must still be at church. So as Daniel tucked Naomi and substitute Puppy in for a nap, I hurried over to the church to sort through the toy cabinet and find him. There he was, buried under some play clothes and a fuzzy, well-loved bear. I could almost hear his little whimper of relief at being found. And then, Puppy got to have an adventure of his own. I had decided to pick up some groceries while I was out, so I brought him into the store with me. 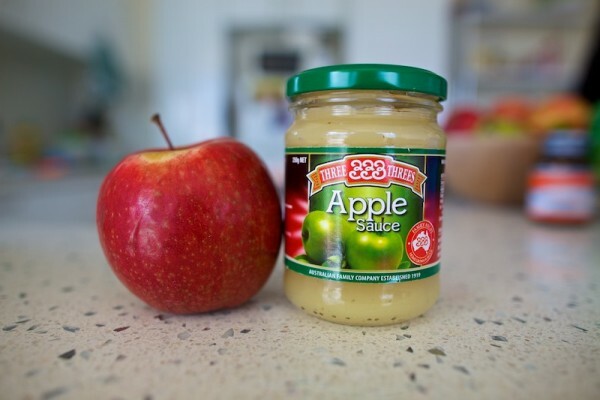 Can someone please tell me what crime applesauce committed against the Australian people, to cause them to mandate it being sold in jars this small? I have looked in several stores, several times, searching for a decent-sized jar of applesauce, but all I can find is this measly little 250g jar. (How much is 250 grams anyway? Not enough for the Peckhams, that’s how much.) I bought one of these jars 2 weeks ago, used the entire jar the next day in one recipe of oatmeal breakfast cake (which calls for a cup, so I guess that’s how much 250 grams is), and suddenly it was gone. It’s normally a staple in our kitchen – Naomi and I love it straight up, I use it in several of our breakfast recipes, Daniel adds brown sugar and cinnamon and eats it for dessert. We usually buy the triple pack at Costco – 3 huge 48-oz jars of unsweetened applesauce, and that doesn’t last us for too long, depending on Naomi’s applesauce-mood. On top of that, this teeny tiny jar costs something like $3. And it’s sweetened. Sheesh. Note: Ok, I just did a little research online and deduced that Australians view applesauce as a topping for meat. I guess that explains it. The website for the brand I bought had it listed alongside “mint sauce” under their line of sauces and spreads, and the only serving suggestion they gave was, “Serve with Roast pork or pork chops.” I like applesauce on my pork too, but to confine it to a condiment alone is such a mistake. Australia, you just don’t know what a good thing you’re missing. Yes, I’ve heard of it. What is it? Thanks for the suggestion! I love your story about Puppy . . . we have 3 wockets for the same reason (currently monikered “Upstairs Wocket,” “Downstairs Wocket,” and “Spare.”). We go through applesauce like no one’s business too. That jar is, what, about the size of two individual to go applesauce cups? Vegemite. so what did you think? I have horrible memories of that stuff. Never understood why people liked that! I second the pavlova suggestion. It’s basically a big meringue, with crunch on the outside but a soft texture inside, topped with whipped cream and (usually) fresh fruit. My advice on Vegemite is to spread it veeerrry sparingly on top of plenty of butter or margarine on a slice of good toasted sourdough or Turkish bread (Turkish bread is chewy, aerated bread very popular in Oz). Some people also add it to soups and stews, almost as a flavouring agent, like soy sauce. 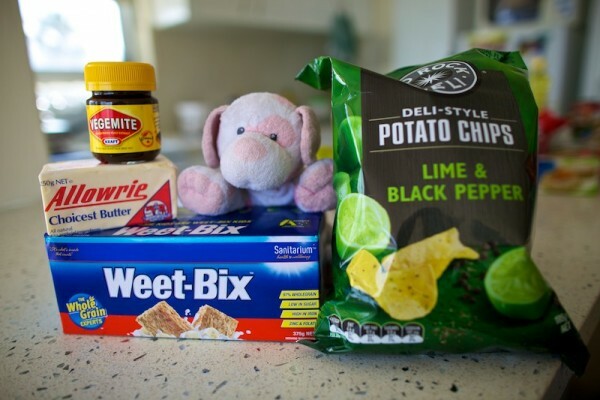 Good luck – I have to say, the very limited number of Americans I’ve come across that liked Vegemite were all vegans! Interesting! (about the vegan thing) Thanks for the advice and I’m glad I got before we tried. I will see how that goes!